The 2017 school year at Somerville House will herald the opening of the School’s new Bauer Building, delivering world-class accommodation and dining facilities for Somerville House boarders. 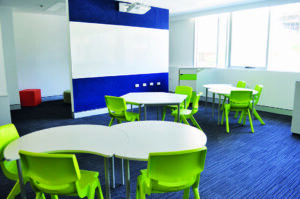 As the new home for the Year 11 and 12 boarders, the Bauer Building will offer the luxury and space of twin share bedrooms for our Year 11 students, and single bedrooms with shared ensuites for our Year 12 boarders. These new facilities have been designed to accommodate the best practice in boarding, meeting the necessary balance between personal privacy and cohesive communal living. The natural progression of the boarders as they reach their senior years requires greater privacy and quiet space to meet the increased needs of their academic studies. The elegant and expansive new dining hall, known as the ‘Bentley Room’, features an impressive commercial kitchen, timber floors and floor to ceiling glass walls overlooking Brisbane city. In Somerville House tradition, all boarders from Year 6 to Year 12, gather in the dining room each night to say Grace, and share dinner together as a boarding family. To cater for special occasions such as visits from family members, a private dining room is also available for boarders to share a more intimate meal and catch-up with their loved ones. A communal terrace area, built on the tenth floor of the building, offers incredible, sweeping views over the city, and a leafy, outdoor space for our boarders to enjoy barbeques and al-fresco lunches. 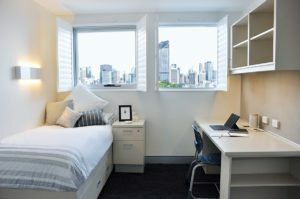 The central location of Somerville House means students have the cultural heartland of Queensland literally on their doorstep, with easy access to South Bank Parklands, the Queensland Performing Arts Centre, the Queensland State Library, Museum and Art Gallery, the Botanical Gardens and much more. According to Somerville House Principal Florence Kearney, the School’s boarding facilities provide a supportive environment where each student is encouraged to balance structure with the freedom to develop individually. 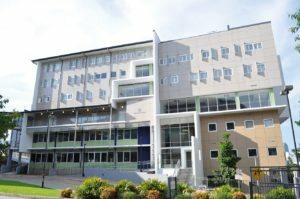 “Seventy per cent of our boarding families come from regional and remote areas, which may not offer the educational opportunities and resources that are embraced by our students. I highly value the opportunity for girls to attend a school such as ours and be able to call Somerville House their home away from home,” Mrs Kearney said.